Suitable for people suffering from symptoms such as: hoarseness from vocal strain, overuse, or incorrect use, acid reflux, and any medically diagnosed first stage lesions on the vocal cords e.g. warts, cysts, polyps, etc., and any general difficulty in producing a clear voice. When is Powerful Vocal Recovery Kit (PVR) to be used? PVR kit is herbal vocal remedy beneficial when the symptoms and issues you are experiencing begin to affect the comfort, ease and tone of your voice, when phonation becomes difficult to achieve as compared to normal phonation; or when a diagnosis has been given, along with a course of treatment by your doctor or vocal specialist. Intensive, herbal vocal remedy treatment is recommended until relief is achieved. This kit has also been designed to prevent future difficulties and to improve tonal quality. We recommend that you follow the guidelines listed in our vocal health pamphlets dedicated to voice care. We also advise you to combine this treatment with proper nutrition, vocal therapy, a vocal training routine and vocal rest. In addition, it is recommended to practice talking and/or singing with the nose clip as this will help direct the resonance sensations into different spaces in your mask and can sometimes help alleviate the strain on the vocal mechanism. What does PVR Kit do? PVR Kit facilitates and aids the body to shrink lesions, if any, or reduce other vocal problems; such as, redness, swelling, or inflammation. 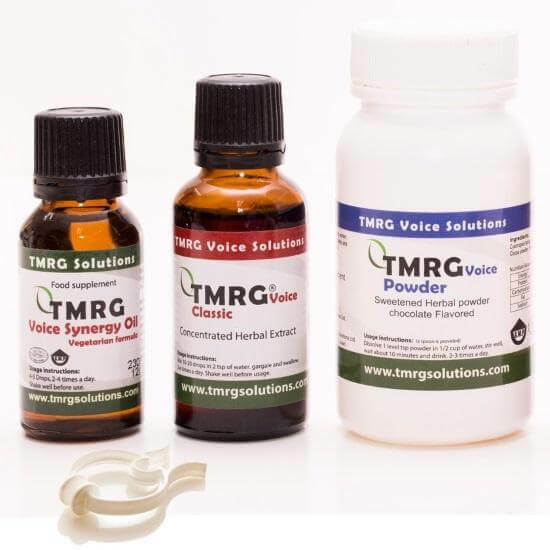 Using this series of herbal remedy products in conjunction with good healthy vocal technique and proper vocal hygiene practices can help the rehabilitation of the voice and recovery can be accelerated. The process in which the body responds to treatment will always differ from person to person, and occasionally more time and rest may be needed. Nevertheless, in most cases that we are aware of, vocal health is significantly and rapidly improved. Using this series of products in conjunction with good healthy vocal technique and proper vocal hygiene practices can help the rehabilitation of the voice and recovery can be accelerated. The process in which the body responds to treatment will always differ from person to person, and occasionally more time and rest may be needed. Nevertheless, in most cases that we are aware of, vocal health is significantly and rapidly improved. Once there is significant relief, reduce the dosage, but keep up the vocal maintenance according to the instructions in the pamphlet. In case of any of the heavy problems mentioned; cysts, polyps, etc., we recommend to continue using the treatment, even after an intensive period, for example of 5-8 days. But reduce the dosage, and increase the number of times a day for a longer period of time anywhere from 20-30 days. First step: Mix 10-15 drops of TMRG Classic Extract(#2) in a cup with 2 teaspoons of water. Gargle for 10 (just 10s ? ) seconds and swallow. The extract disinfects and cleans the throat in the vocal cord area; helps open the resonance cavities, whilst accelerating the voice’s natural rehabilitation process and reducing hoarseness. Second step: After approximately 1 hour, massage the throat area around the Adam’s apple with 2-3 drops ofTMRG Voice Synergy Oil (#7). Then place 1 drop on the deep center of the tongue. The oil penetrates the blood system, releases and relaxes the muscles, tissues and ligaments around the vocal area, and disinfects the throat area. Improvement will usually be noticed immediately, even in cases of significant problems. In case of inflammation of the throat, vocal folds, or tonsils – mix 3 drops of the oil with some honey and one-quarter cup water. Mix and drink 3-4 times a day. Third step: After an hour, drink 1-2 cups of water, and then use the TMRG Powder. Measure 1 level teaspoon of the powder and mix it in one-half cup water. Wait for about 10-15 minutes until a smooth, liquid gel-like texture is created, and then drink the thick liquid, from 2-3 times a day. If the texture/taste of the liquid is not appealing, one can sweeten it as needed, or double the quantity of water, or mix the liquid with pudding or a hot drink. The powder once mixed with water becomes smooth and pudding like, will coat the vocal tract and be absorbed into the digestive system. Use the TMRG Classic Extract (#2), TMRG Voice Synergy Oil (#7), and TMRG Powder (#5) one after the other throughout the day. If the intensive course of treatment suggested above is not possible due to schedules – it is possible to adjust the times. These are natural products and so, the instructions are not as rigid as with conventional drugs. The idea is to treat intensively for the first couple of days until relief is felt. Naturally, any degree of consistency will still be of benefit. Recommendation: Singers/lecturers/voice professionals – in order to have a clear and good working voice, drink the TMRG powder (#5) solution approximately 1.5 hours prior to performing in order to “pad” the throat with minerals that will soothe the outer muscles of your voice. 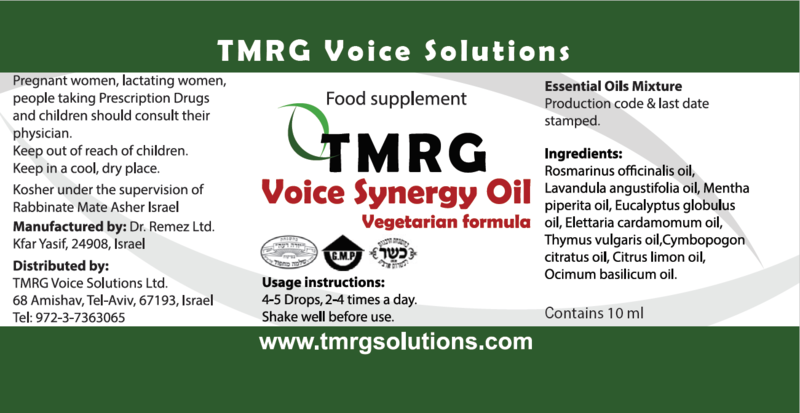 Singers and public speakers, immediately before going on stage, gargle and swallow the TMRG Classic Extract(#2), massage the throat with the TMRG Voice Synergy Oil (#7), and add a drop to the mouth. Repeat during breaks. Use the TMRG Classic Extract, Voice Synergy Oil, and Powder in sequence throughout the day. If the intensive course of treatment suggested above is not possible – adjust it to your needs. These are natural products, as such; the instructions are not as rigid as they are with conventional drugs. The idea is to treat intensively the first couple of days until relief is achieved, though any use will be beneficial. Recommendation: Singers/lecturers – in order to have a clear and beautiful voice, drink the powder solution approximately 1.5 hours prior to performing in order to “pad” the throat. Immediately before going on stage, gargle and swallow the TMRG Classic Extract, massage the throat with theTMRG Voice Synergy Oil, and add a drop to the mouth. Repeat with the extract and oil during breaks. I lost my voice from a sinus infection and cough but had to continue singing on gigs. 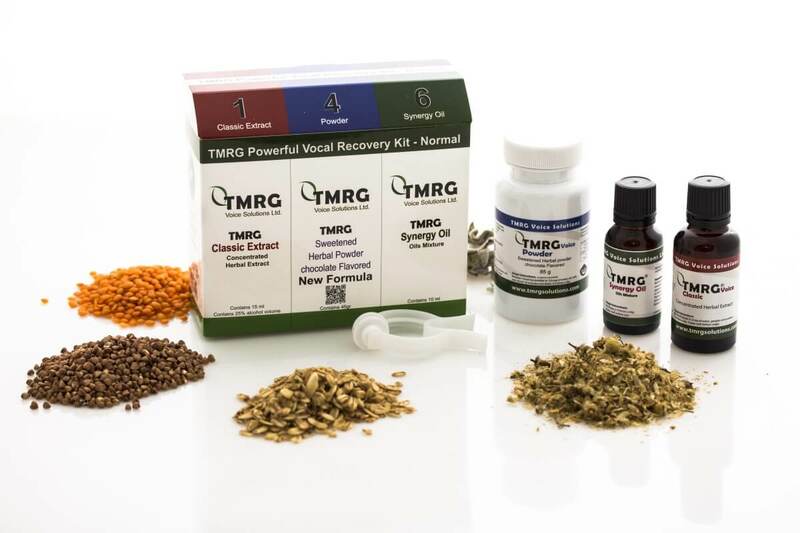 I used the TMRG Recovery Kit daily, and it helped me get through some extremely difficult situations. The herbal extract and oil do a great job of opening up your resonance passages, and the powder/gel is very effective in coating your throat. I would absolutely recommend this to anyone who has to sing through sickness.